Columbus' #1 Virtual Reality Rental Co.
Want to bring VR to your next Columbus event? We will make it easy & ensure your guests have a blast. We've worked with the likes of Twitter, GE, & Macy's. Easily book virtual reality for your next event in Columbus, OH. We have the best equipment, customer service, and virtual reality experiences. Do you want to wow your guests? Do you want them to talk about how awesome your event was the next day, week, or month? If you answered yes, then you're going to need to offer your guests something new, creative, interesting, and fun. That's where virtual reality (VR) comes in. Virtual reality (VR) is the hottest new technology and it delivers a new, fun, relevant, and interesting experience to all types of events. If you're not sure how renting virtual reality (VR) for your next Columbus event would work or you want to talk specifics contact us and we will be happy to help. Also known as Buckeye City or The Arch City, Columbus, Ohio, is the largest city in the U.S. state of Ohio. The capitol of Ohio, the city is home to the Columbus Zoo and Aquarium, which is known for its emeritus director Jack Hanna and its world-famous animal collections, including lowland gorillas, Siberian tigers, and kangaroos, among other exotic animals. Or visitors can travel to the Franklin Park Conservatory and Botanical Gardens, which contains over 400 plant species in a wide variety of different biomes. The lone professional sports franchise plays at Nationwide Arena, which is the home of the NHL’s Columbus Blue Jackets. And the perennial college national title contenders the Ohio State Buckeyes play further to the North at Ohio Stadium. With all of the available awe-inspiring outdoor activities in beautiful Ohio, it’s time to crank up the excitement at your next event. But how? Easy! Implement Virtual Reality (VR) technology and impress party-goers. 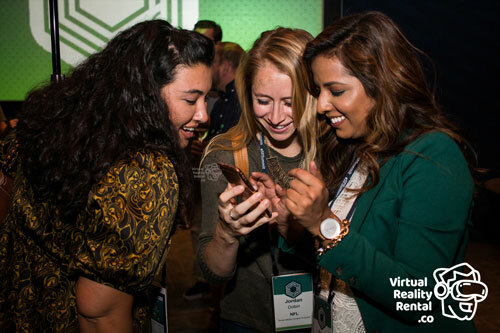 Our event experts will help you develop your next event using the best in high-tech VR technology. Whether you want the latest in games, puzzles, videos, and more, VirtualRealityRental.co has you covered. Our professional staff will work with you to design and implement your ideas to make your next event a unique experience for your guests. Using only the highest-quality equipment, VirtualRealityRental.co works to make sure your guests have an exciting time. So, call us today to get started! "I have a passionate globetrotter inside me which found a way to escape and explore at the business event in Columbus. I thoroughly enjoyed the VR experience offered by the organizers." "While I was physically present in the conference hall, my soul was galloping with the horses on the lush green fields. I had a memorable tryst with VR at the business event today." "At the age of 60, we rarely think of trying new things. I’m so glad the organizers gave us the opportunity to try VR. An unbelievable experience for an old man." "The VR booths at the corporate event gave us a window to an exciting new world. Had an experience I’ll remember and talk about all my life." "When I came home after attending a business event in Columbus, I had interesting stories to tell my children. VR entertainment is absolutely wonderful." "In my busy life, I rarely get time to enjoy myself. Today at the business event, I tried VR and felt alive once again. I came out feeling so fresh and energetic." Our staff members are 1/2 VR technicians and 1/2 brand ambassadors. Let us help you think through the best way to leverage their stills to increase brand awareness and/or leads.